Ben Barnes as Billy Russo in The Punisher. Though neither Frank Castle nor Billy Russo were fully aware of it at the time, their final confrontation in The Punisher’s first season was overlaid with a thematic weight that was larger than the sum of its parts. Their fight was a chance for Frank to avenge his family’s deaths, yes, but it was also a moment that hammered home how interwoven Frank and Billy’s identities are. Frank and Billy’s season one fight was peak Punisher, which is to say that it chose to forego any sense of narrative subtlety in favor of visceral ultraviolence. But beneath the surface level of gore and brutality, the scene telegraphed a number of things about the characters’ relationship that only became more explicitly defined in the show’s most recent season—which is now streaming on Netflix—as Billy recovered from his injuries and began his transformation into the villain classically know as Jigsaw. While the show makes a point of never referring to Billy by his villainous code name, he’s very much an important piece to a puzzle The Punisher is trying to contemplate, but not necessarily solve by the season’s end. 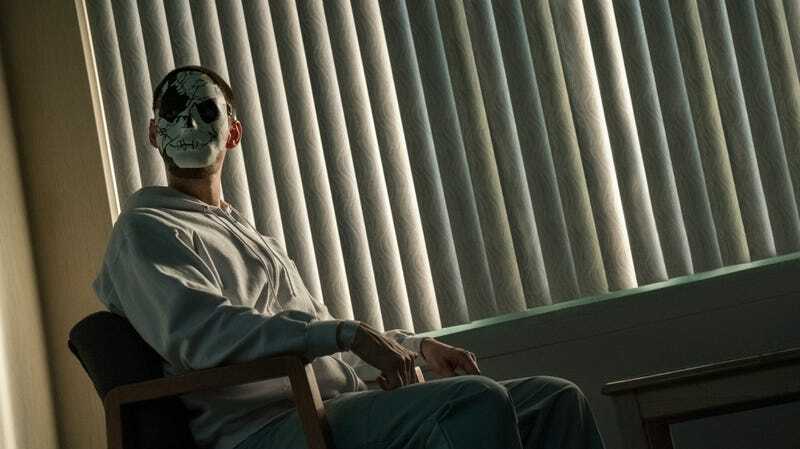 The Punisher’s second season very quickly lets you know that while comics Jigsaw is known for his mangled face, his live-action counterpart is given access to much better plastic surgeons who, after hours of painstaking work, are able to get Billy back to looking more or less like Ben Barnes after a particularly heinous shave in the dark with a dull razor. When you pull back to look at The Punisher as a whole, Billy’s lingering cosmetic scars are meant to be a nod back to Homeland Security Agent Dinah Madani noting in season one how curious it was that Billy’s face remained undamaged despite the many wounds he received while in the Air Force. But the real damage that Billy has to recover from in the wake of his fight with Frank is psychological in nature, and something he’s utterly unprepared to deal with until he begins working with Dr. Krista Dumont, a psychotherapist who specializes working with military veterans. In Marvel’s comics, Billy’s path to proper supervillainy is rather straightforward—after he’s hired by the Costa mob family to eliminate Frank, he fails, and Frank subsequently throws him through a window, leading to his signature visage. Nightcrawler, the Punisher, and Spider-Man apprehending Jigsaw in The Amazing Spider-Man #162. The Punisher’s Billy carries far more psychological baggage and trauma at a much earlier point in his life, which the show delves deeper into in its second season. Unlike Frank, who grew up with both of his parents at least trying to raise him, Billy was abandoned as a child and cycled through the foster care system, which left him with virtually no support network during the foundational years of his life. The new season revisits the time in Billy’s life when one of his caretakers in a group home attempted to molest him, and while this is something that’d previously been established about Billy’s past, the show makes a point of illustrating just how much of an impact it had on him. Much of Dr. Dumont’s work with Billy is centered around trying to help him recover his lost memories and make sense of the repeated horrific nightmares he has about his confrontation with Frank. All Billy can piece together about his dreams is that he’s being menaced by a huge skull while his face is smashed into a mirror over and over again. It would have been easy enough for The Punisher to simply put Billy through a few rounds of therapy, leading up to his memory snapping back into place, and to him assuming the Jigsaw identity as he seeks out revenge against Frank. Instead, what we see is that Billy’s recovery comes in fits and starts; at times, he makes progress before taking steps backward and pivoting into new directions entirely. Mutilated though Billy is, he’s still charismatic and capable of convincing Dumont to see things from his increasingly-twisted perspective, which makes their sessions together that much more dangerous. Initially, Dumont’s goal is to help Billy rebuild his shattered sense of self. As their sessions become increasingly intimate and unprofessional, though, Dumont and Billy’s dynamic becomes increasingly darker, more sexual, and at times sadistic. At times, you can’t help but compare the two to the Joker and Harley Quinn and see echoes of David Cronenberg’s Crash woven into the way they connect with one another. That being said, you also can’t deny that both Billy and Dumont do begin to care for one another in earnest, warped as their relationship is. Billy Russo and Dr. Krista Dumont in a therapy session. What interesting about Billy’s arc over the season is that as he does begin to cobble together a new identity that’s a blend of his fragmented, recovered memories, and a newer, more unhinged persona. You can see how, on some level, he’s attempting to build a “stable” life for himself complete with allies and a love interest. When he isn’t running around New York with his guns a-blazing, he’s trying to establish some semblance of the kind of support network he never had in his youth, and then later lost following his betrayal of Frank. Whether Billy ever understands that pattern in his behavior isn’t exactly important because his story isn’t The Punisher’s main focus. It’s fair to say that Frank is ill-equipped to deal with the many layers of Billy’s pain and trauma—it makes sense for his character. But it also means that Frank can never really take Billy on the way a “traditional” superhero would a villain. If The Punisher was a more straightforward, big-screen production meant for a broader audience, it stands to reason that Billy and Frank’s interplay would involve a higher degree of self-reflection for both of the characters. Something that would spell out the ways in which the two of them were, in reality, warped reflections of one another. But deep introspection is neither of their strong suits, and while at one point during a fight late into the new season Billy literally screams at Frank that they are one another, his words fall on deaf ears. The closest Frank ever comes to being able to see himself in Billy is when he stabs him in the gut with a jagged mirror shard—a moment that’s a tragic snapshot of their inevitable end. In a different world, under different circumstances (like in proper therapy and counseling the way Curtis Hoyle has been telling them all to get for years), Frank might have been able to help bring Billy back from the edge and serve him more humane justice. But The Punisher isn’t interested in that sort of thing.